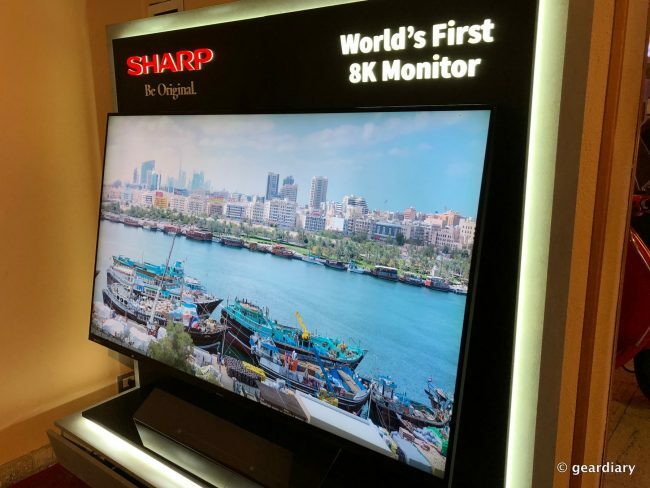 At the IFA Global Press Conference in Rome, Sascha Lange, Vice President Marketing and Sales at Sharp, was present to announce that their AQUOS 8K LV-70X500E television will be available in Europe at the end of April. This television offers an insane 7680×4320 pixels, and it was previously only available in Asia. The obvious benefits to an 8K television set include overwhelmingly realistic, practically 3D images and being able to see things in images that we’ve never noticed before. Think about it — if you think you can see every wrinkle and mole on your favorite actor in 4K, just imagine what they’ll look like in 8K! If you think you can see every blade of grass during a football game televised in 4K, imagine what you’ll be able to discover in 8K! But to bring things back to reality for a moment … If you live in the US, you might be wondering why anyone would even want an 8K television when hardly any shows (much less, channels) are broadcasting in 4K. Okay, I take that back — of course, we should all be at least a little bit intrigued by the prospect of an 8K TV because it’s the latest and the greatest, right? Maybe we should all just skip 4K and dive right into 8K? In the US, pretty much the best we can stream is 4K UHD content (or four times better than 1080p HD), and that’s not even consistent. There are more and more broadcasts being done in 4K now, but it is still far from the norm. Netflix has been great about giving us that 4K magic (assuming your broadband is fast enough to support it), and major sports broadcasts in the US have been utilizing 4K for a few years. But with certain exceptions, the rest of the time our 4K televisions have to upconvert the 1080p (or worse) content they are showing to four times that content’s original size. Assuming you have a 4K TV with a good scaler, it can do an excellent job of upconverting although the 1080p video may show as a little less sharp (no pun intended) than hoped for — that’s just a by-product of watching upconverted 1080p content on a 4K TV. So while it might be a bit of a bragging point (without much meat behind it much of the time) to say that you have a 4K television — unless it’s game day or you’re solely watching 4K videos or broadcasts — you’re really just enjoying 1080p content (if you’re lucky) that’s being upscaled to fit your higher resolution TV. Make sense? While I have no doubt that the 70″ Sharp has an excellent scaler built-in, it’s still a bit daunting to realize that in order to show the typical 1080p video on that 8K TV, the 1080p content will have to be upconverted to 8 times its original size. What can you actually watch in the US that’s shown in 8K now? Not much. YouTube has a collection of 8K content, and there might be some sporting events filmed partially in 8K (like portions of the last Olympics were), but if you are outside of Taiwan, China, Japan, and now Europe — good luck finding much else. Other markets, however, are dipping their foot in the 8K pool. Japan has at least one channel that has been broadcasting content in 8K since last year, and Europe is talking about broadcasting some 8K sporting events this year. All this to say that if you live outside the US, an 8K TV might sound tempting, but let’s be real. If you have a 4K TV in the US, you don’t need to be jealous that we aren’t getting this particular Sharp AQUOS 8K — yet, anyway. I’ll bet that we won’t even have regular 8K broadcasts for another 10 years, which will be just about the time I’m ready to replace my 4K televisions. Disclosure: I’ve just returned from the 2018 IFA Global Press Conference in Rome, Italy. The GPC is the yearly conference leading up to IFA in Berlin; the GPC consists of multiple power sessions throughout its two days, and it’s a time for select companies to showcase products they’ve recently released or that are coming soon. My airfare and hotel were covered by IFA with no input regarding what I might choose to cover.